The illicit use of drugs involves millions of people worldwide and is associated with a variety of medical complications. In recent years the abuse of both heroin and cocaine have produced major medical problems across the globe. Other illicit agents such as barbiturates, ethyl alcohol, amphetamines, and phencyclidine, as well as drug combina tions produce medical complications as well, sometimes with renal manifestations (Table 1). An estimate of 5-6% of new patients beginning treatment for end stage renal disease in the United States appear to have opiate-related kidney disease . 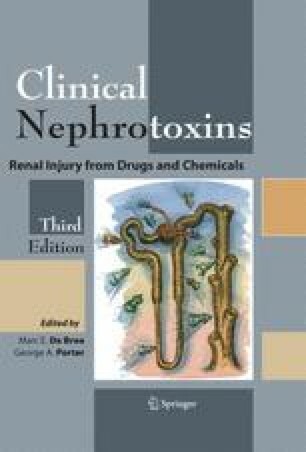 This chapter will review the various renal manifestations of illicit drug abuse. It will focus on the clinical and pathologic presentation, the course, the treatment, and the pathogenesis of these lesions. Secondary renal infectious complica tions will not be discussed, except for the interrelationship of HIV and heroin nephropathy.